North Clear Creek Water Treatment Plant – Martinez Associates, Inc.
Martinez Associates was retained by the Colorado Department of Public Health and the Environment (CDPHE) to provide construction materials testing and observation services during construction of the new water treatment facility which was funded by the EPA as part of the overall cleanup process of the extensive mining sites in the area. 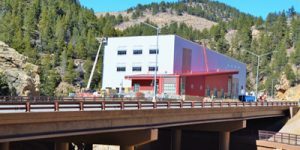 The Operable Unit Four (OU4) water treatment plant was built to treat the mining impacted waters along North Clear Creek. The facility is designed as a fullscale and fully functioning automated lime high density sludge precipitation water treatment plant. 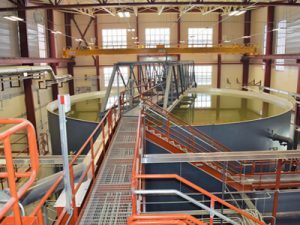 The plant will treat a design flow ranging from 200 to 600 gallons per minute. The plant building is approximately 17,000 square feet with the bulk of the building being a processing room. The water treatment equipment includes a series of tanks at various elevations and below grade water vaults which may require some hard rock excavation. Martinez materials testers and inspectors observed the installation of drilled shaft foundations to mitigate potential differential settlement due to the varying depth of bedrock across the site and the presence of a recently constructed rock fill. The site also has over excavation beneath the floor slabs and the concrete pavement. Martinez performed field moisture-density testing of the pipeline backfill, backfill of the over excavation areas, testing of the fresh concrete and cured concrete cylinders for compressive strength.